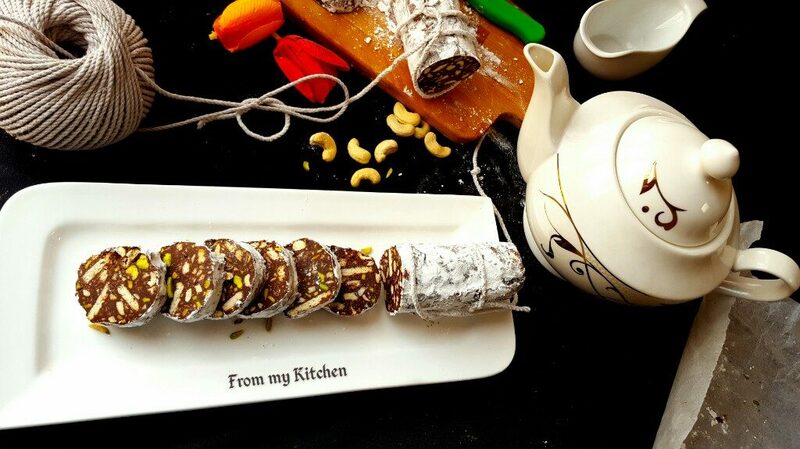 A delightful log of no bake chocolate cookies!Simple and delicious that prepares in no time. “Salami” stems from physical resemblance. 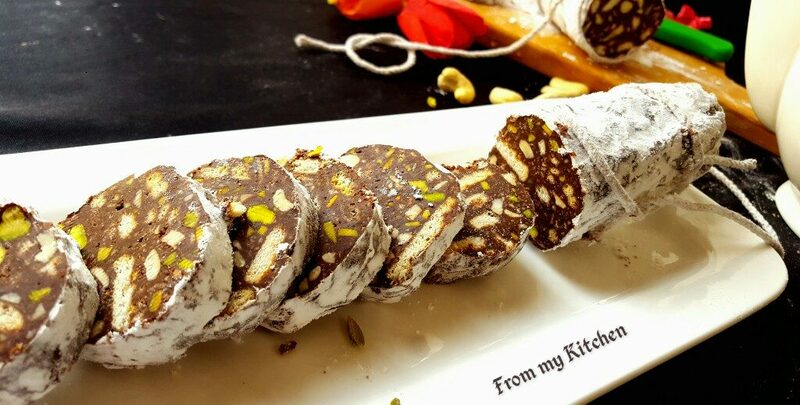 Like salami, chocolate salami is formed as a long cylindrical log and is sliced into discs for serving. A crunchy,nutty,chocolaty goodness for a quick chocolate craving. Can you see that hanging over? 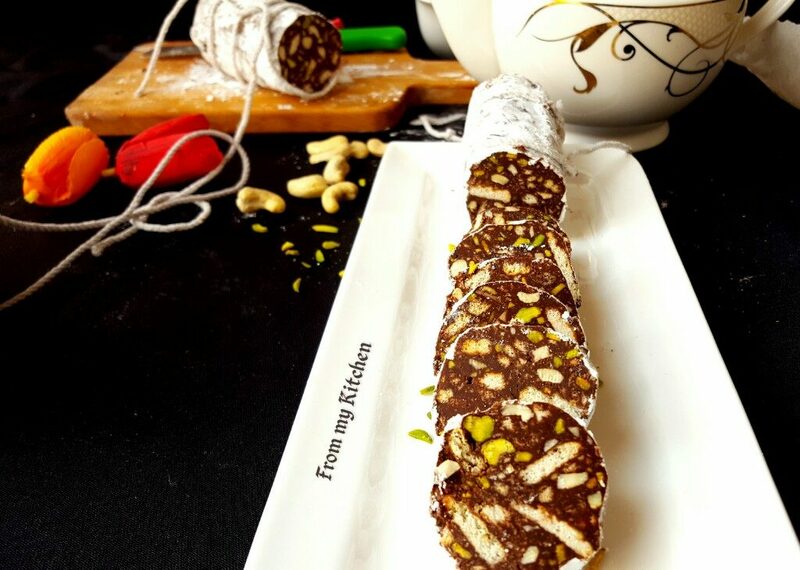 ?Hehe!That’s because it’s called as Salami.This is prepared with crushed tea biscuits.roasted nuts and any dry fruit of your choice coated in melted chocolate and butter.It’s really a tasty and simple treat with all those crunchy biscuits and nuts.Kids just loved it. 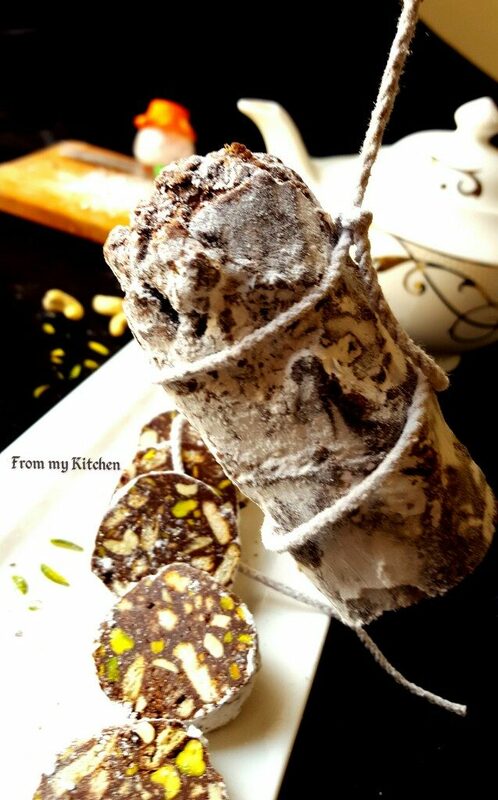 After mixing all these we should transfer it to a cling film and form to log shape.Then need to set in refrigerator for 3 to 4 hours.Then coat it in icing sugar and serve by slicing it,I forget to take the pictures of knotting the twig. 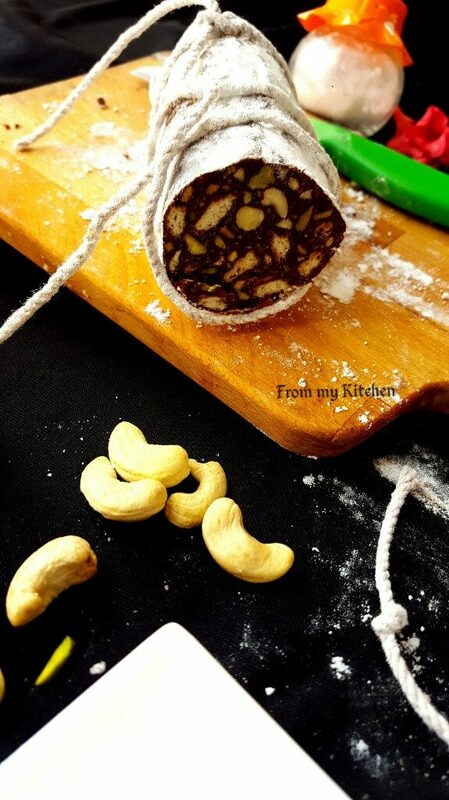 Do same with nuts.Keep both aside. Melt the chocolate and butter in a microwave or using a double boiler method and mix well. Now add cocoa and sugar and vanilla essence and mix well . 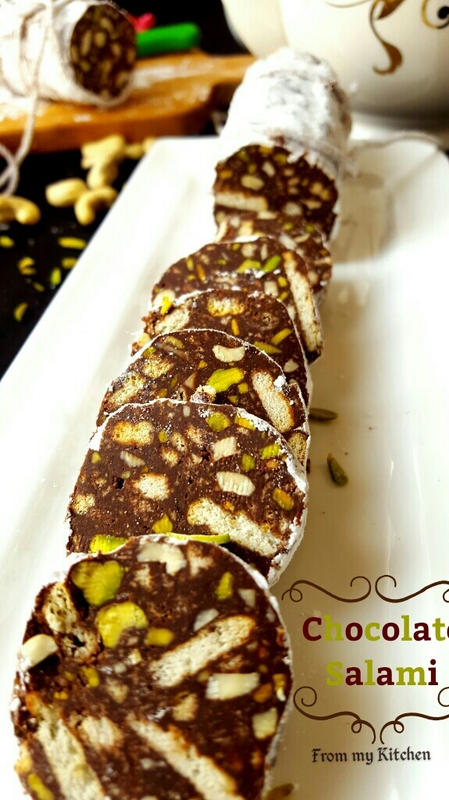 Dump the biscuits and nuts both in the melted chocolate and mix well until all the biscuits and nuts are fully coated with chocolate. 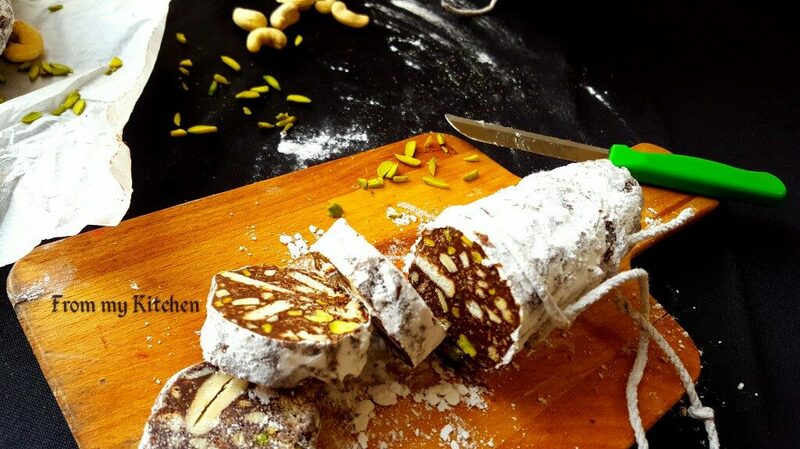 Now dump it to a cling film and shape it to a log by covering and rolling it tightly. After 3 to 4 hours take it out from the refrigerator and coat it in icing sugar. Cut the slices and enjoy! Note: You can use finely chopped dates here if u like. 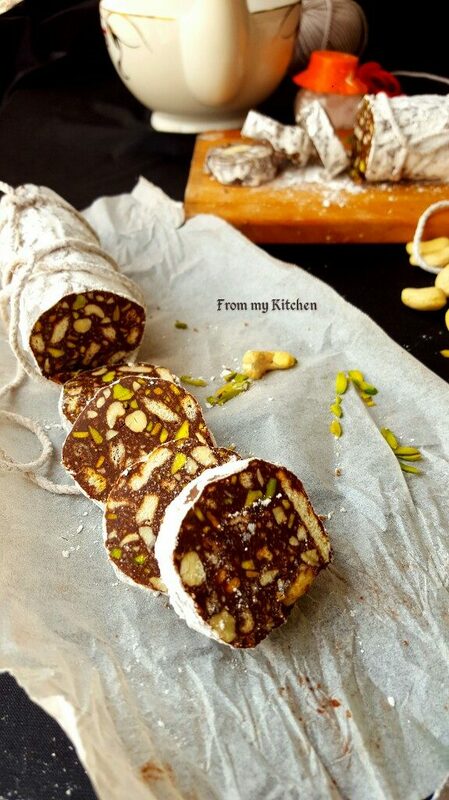 I’m sure this one is to die for.I used to make something similar with dates.Instead of chocolate we use pitted dates and butter. (for that cooking is needed)I love that so much too. Relish it with your kids!! HEHE! !Thank you raf!It's worth trying and delicious!